Most 12-year-olds are learning how to manage their schedules, organize lockers and coordinate homework to make sure it all gets done on time. Learning how to organize a pill box isn’t something you expect a 12-year-old to do, but it’s a skill that Emily Adams has mastered quite quickly. She organizes the pills in plastic boxes and keeps track of when to take her medications and when she needs a refill. “I never imagined I’d be taking so many pills at such a young age,” she said. It’s been about 18 months since Emily was diagnosed with lupus, although she had symptoms for about six months prior to diagnosis. Initially she had a cold that wouldn’t go away. Then doctors said she had a sinus infection – then there was even sinus surgery. But still, things didn’t seem right. Emily just wasn’t getting better. She started having joint pain and developed a rash on her face. 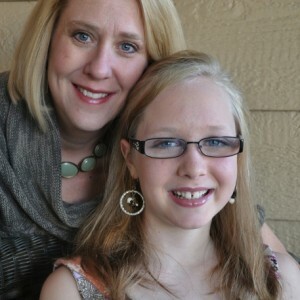 Her parents said getting someone to take Emily and her symptoms seriously was frustrating. “Doctors would say, ‘Do you know how many kids come in here with red cheeks and flu-like symptoms,'” her father said. Eventually a rheumatologist diagnosed her with lupus. Emily had never heard of the disease. “I sensed it was pretty bad,” she said. “Here I was a Children’s Hospital in Denver, not my regular doctors. And I knew I’d need to take a bunch of medicines I’d never heard of. It was a big bombshell,” she said. “For a milli-second we felt a huge sense of relief,” her dad said. At least they knew what the problem was, but Emily’s parents’ relief was short-lived when they learned more about the symptoms of lupus, its long-term impacts and that there is no cure. Some medicines help, but most have side effects. For instance, Emily was on 60 milligrams on prednisone per day. There are many possible side effects of prednisone, for Emily it caused weight gain and “moon face,” causing her face to swell up into a round shape. Emily said she didn’t want to go out of the house. She wanted to look strong and fit – as she had in the past. In addition to the weight gain, her joints hurt and her hair was thinning. All difficult symptoms to handle for anyone, but especially in the middle school years when pre-teens want to fit in with their peers and other kids can be so judgmental. All-in-all, the disease has been isolating, Emily said. At school, her friends didn’t want Emily to touch them for fear they would “catch” lupus. Many don’t understand why Emily can’t hang out and can’t sustain a normal energy level like they can. “I’ve lost a lot of my friends,” she said. Making things more challenging socially, Emily is being home schooled to allow for flexibility in her schedule so she can sleep when she needs to. In addition, before lupus, she spent a lot of time practicing and competing with the local swim team. She practiced on weeknights and competed on weekends. Ribbons, including many blue ones, trophies, and swim posters of Michael Phelps decorate a wall in Emily’s bedroom. She looks at the wall in resignation and hopes that she can swim again someday. But with all that’s been lost and given up because of lupus, there are new things that have been discovered. There are new friends that Emily met at a camp in Pennsylvania for those with lupus. The first person she met there was a girl her age, Gwen. Though they live many states away from one another, they’re now best friends and keep in touch on the phone. They laugh and joke just like other girls their age, but coping with lupus together gives them a special bond. Emily said she also has a newfound appreciation for her sisters. “They try to understand, take care of me, and protect me,” she said. While playing music in the basement with her sister, Emily discovered how much she enjoys playing guitar. She also cherishes the closeness of her family. She appreciates her dad who provides for the family and her mom, who’s the caretaker, and her sisters who are so supportive and protective of her. “There’s a lot more to us than you see,” Emily said.